On Thursdays, seniors and youth will be working in the garden together. This way, the seniors can share their wealth of knowledge with the youth, and the youth can help the seniors with the more physically challenging gardening tasks. 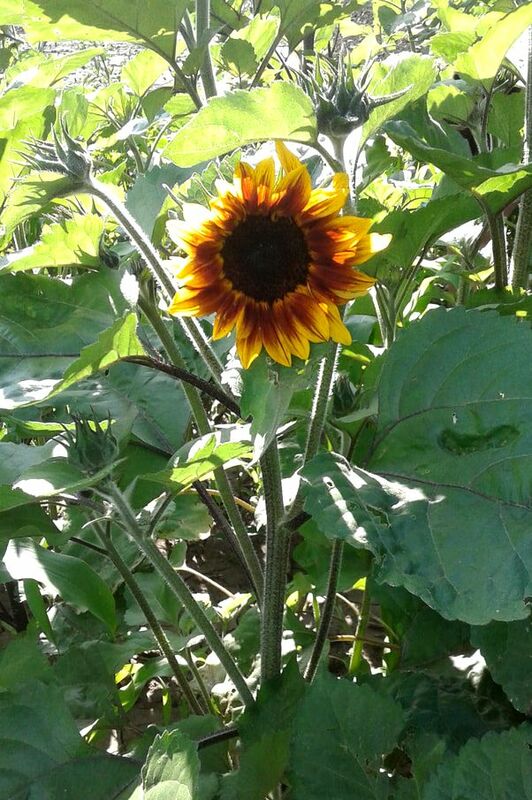 One of the first sunflowers of the season. Abbigail is a student from The King's University who is doing an internship at Lady Flower Gardens this summer. This internship in experiential learning about social justice forms a part of her course work to earn a certificate in social justice studies from the Micah Centre at King's alongside her regular degree program of Politics-History-Economics. Abbigail will be working with the groups that come regularly on Tuesdays and Thursdays, as well as coordinating the visits from youth and seniors groups that come on Thursday afternoons. Here are just a few of the many plants found in the forest at Lady Flower Gardens. Thursday groups are welcome to schedule a tour of the forest to see (but not harvest or pick) the incredible diversity of the old growth forest. The small hairs on this plant will sting you if you touch it, but when the leaves are dried or cooked, stinging nettle is actually very nutritious. The stalks can be used to make clothes, nets, snares, and other things. This plant can be used in a spit poultice to help heal wounds and sores (helpful if you run in to some stinging nettle!) It grows where the soil has been disturbed. The stalks of this plant are used as a vegetable; it smells similar to celery. But be careful because this plant closely resembles a different plant that would give you a severe rash if you touched it! It's a very versatile plant - the dried roots are used in traditional medicine to cure coughs and also constipation among other things. The biggest poplar I’ve ever seen. We call this tree the keeper of the forest. Mushrooms are the fruiting bodies of mycilia, which are found all throughout the forest floor like a nervous system. This mushroom is edible but it needs to be washed before eating. It is rare to find one of these so early in the season. A plant in the daisy family that can be used to treat headaches. Full of vitamins A & C, wild violet plants are edible as well as pretty! A “living fossil” – the only kind of plant that’s left of a species that dominated forests 541 million years ago. Looks like a horse’s tail. This plant is a member of the legume family. It has pretty purple flowers, and it fixes nitrogen in the soil for other plants to use. *Disclaimer: This information is not meant to be used by those who are looking to identify and harvest plants for medicinal or food purposes. I am NOT an expert (I was just privileged to learn a bit about the forest from someone who is) and any/all mistakes are mine alone. These are just little tidbits of information about some of the many wonderful plants found in the forest near LFG and I hope you've enjoyed this brief tour!